Can't decide between hitting the slopes for a few turns on "The Greatest Snow on Earth," or hitting a round of golf on one of many beautiful municipal courses. You could do both on a sunny spring day in Salt Lake City! You can't beat Utah's Wasatch Front for the variety of world-class, year-round, recreational opportunities all within less than an hours drive. From snowboarding to hiking, from river rafting to snowmobiling , from rock climbing to windsurfing -- there's outdoor fun for everyone. Visitors from all over the country and the world come to ski and snowboard Utah's top-ranked resorts where the "Greatest Snow on Earth" falls along the Wasatch Front, part of the Rocky Mountain Range. Utah's mountains receive more than 500 inches (that's 40-plus feet!) of snow each year. 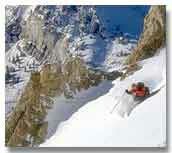 Superior snow conditions were one factor that helped Salt Lake City secure the 2002 Olympic Winter Games. Salt Lake is North America's most convenient ski destination and reader surveys conducted by national ski magazines consistently rank the state's ski areas among the best in the country. Skiers who leave either the east or west coasts in the morning can be enjoying deep powder snow by noon. Seven ski resorts, three Nordic ski areas and the nation's only recreational ski jumping complex are all within 40 minutes of the Salt Lake City International Airport. Beyond skiing, cross-country skiing and snowshoeing are popular winter sports among Wasatch Front residents and visitors. Trails that provide hikers solitude in the summer offer a winter solstice for snowshoers and cross-country skiers. Action, adventure and extremes…or the peace and quiet of mountain lakes and pristine wilderness areas.. It's all here in Utah. The state is world-renowned for its whitewater rafting on the Green, Colorado and San Juan rivers. Cycling opportunities for all abilities have expanded dramatically and the slick rock of Moab is now a mecca for biking families and fanatics alike. Scenic riding, hiking or backpacking in the red rock country of southern Utah or in the alpine terrain in the northern part of the state will bring you in contact with the more than 600 species of animals, birds, fish, reptiles and amphibians make their homes in Utah's diverse habitat, so wildlife watching is a favorite for many. Toss into this menu of recreational activities boating (Utah ranks sixth in the nation in surface acres of boatable waters within its boundaries), fishing, rock climbing and horseback riding to round out the mix . Utah has over 1,000 fishable lakes and numerous fishing streams. Species range from the popular rainbow and cutthroat to large mackinaw and Brown trout to striped bass, walleye, bluegill, whitefish, the Bonneville cisco and many others. Fishing is open year-round in Utah. Species commonly hunted in Utah are deer, elk, antelope, pheasant, duck, geese, sage grouse, forest grouse, chukar partridge, mourning dove, wild turkey, cottontail rabbit and snowshoe rabbit. Applications for all special big game permits requiring a drawing are taken May 5 to 25. .
Bryce Canyon National Park with its thousands of intricately-carved spires rise from the amphitheaters of the park; Canyonlands National Park with views of unfathomable beauty; Capitol Reef National Park with splashes of color in an inviting wilderness of sandstone formations and cliffs; and Zion National Park, one of the nation's oldest parks, with a quiet grandeur that has been carved over thousands of years by the Virgin River. Golf Digest has ranked Salt Lake City as a number one golf city for big cities in the country. Utah's golf courses are famous for their scenery, conditions, variety and low fees. Utah has more golf courses per capita than any other state in the nation. According to the U.S.G.A., Salt Lake has some of the best-maintained and most accessible courses in the country. What do Jack Nicklaus, Johnny Miller, and Bruce Summerhays know that you don’t? Other than a few swing tips, mainly that the state of Utah offers spectacular golf. 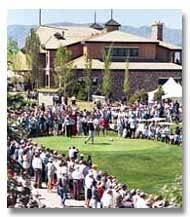 Utah is host to several Senior PGA Tournaments .With amazing scenery and great weather, the state boasts championship golf on courses designed by the pros. Traditionally recognized as a winter recreation retreat, summer sports in Utah are growing in popularity thanks to the golf courses and increased awareness of the state’s magnificent and diverse landscape. From beautiful mountains to panoramic red rock formations to meandering streams, Utah has it all as backdrops for challenging golf.